H&R TRAK+ wheel spacers make your car even sportier! By moving the wheel out from the hub, TRAK+ wheel spacers widen the stance of the vehicle and lower its roll center. This simple modification increases lateral stability, which in turn provides improved handling, greater safety and of course, the sleek style you’ve been looking for. Like all of H&R’s street-engineered products, H&R TRAK+ wheel spacers are certified by the German Technical Inspection Agency (TÜV). H&R also has the correct wheel bolts or nuts to install TRAK+ wheel spacers on most cars, with original or aftermarket wheels. 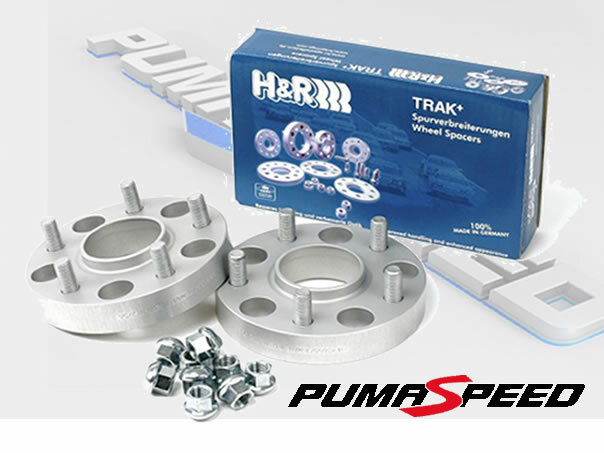 The Pumaspeed Workshop team are ready to fit the 5 Stud H&R wheel spacer kit +40mm in our Head Office located here. Therefore making parts and labour a total cost £173.50 (inc. VAT). Pumaspeed have a specialist distribution team that can dispatch the 5 Stud H&R wheel spacer kit +40mm to any destination worldwide.